The Peppermill Resort Spa Casino is one of those swashbuckling vintage casino resorts that are retro Reno, meaning its been around since 1971. A family-owned enterprise that originally started as a coffee shop, today’s travelers who want to shake it up with good old fashioned gaming sprinkled with dining and a good dose of daytime relaxation by the pool or the spa come here. Located closer to South Reno away from the city’s glitzy flashy main drag the putting greens of the Washoe Golf Course are only a quick drive away. Decked out like a Roman Emporium of stone statues mirroring heroes and goddesses that flank the walkways and public spaces, it’s easy to crack a smile on the noblesse kitsch of cool aspect. They don’t do things small here. 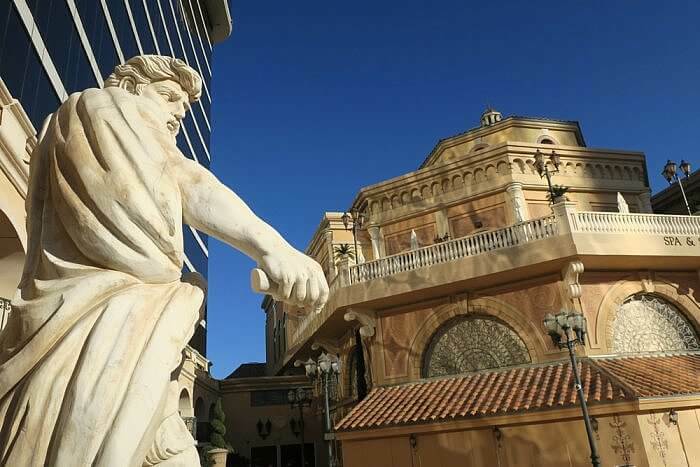 While the whole place verges on that other Romanesque casino in Las Vegas with repro Davids and Aphrodites albeit half the footprint, it is big on unique experiences. 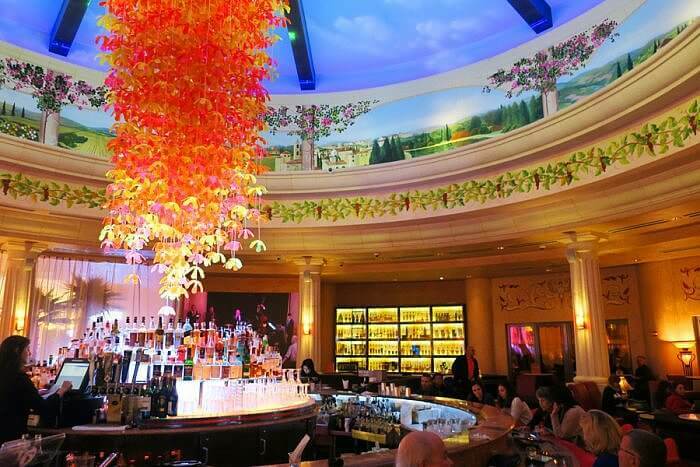 Over 4,400 Italian hand-painted canvases are displayed in one of the resort towers alone. For superstitious gamblers, the resort’s got you covered there too. You won’t find a floor 13. Now why should you go? At the airport a complimentary shuttle bus whisks you past the others waiting in transit. Feels good knowing the service has already started before arriving to the hotel. Aside from the magnificent gaming opportunities, the nightlife scores high as does the regal spa of services, pools, and assorted drinks and snacks. Sweet mountain views of the golden Sierra Nevada give rooms big Wow factor here. 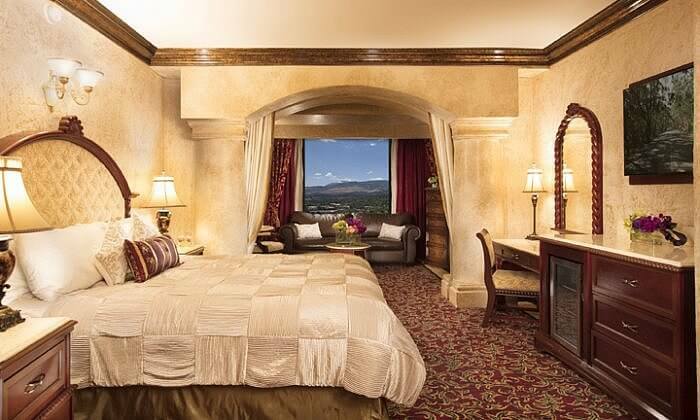 A palatial place of 1621 rooms, there are suite sizes that easily get you to say: “OMG, I can’t believe the size of the room.” My suite in the Tuscany Tower with 2 queen beds had the size of a bathroom that could fit a Manhattan loft in it. Choose from two wings and two towers like the 600 all-suite room Tuscany Tower or the spacious 5,000 sq. ft. Peppermill Tower. 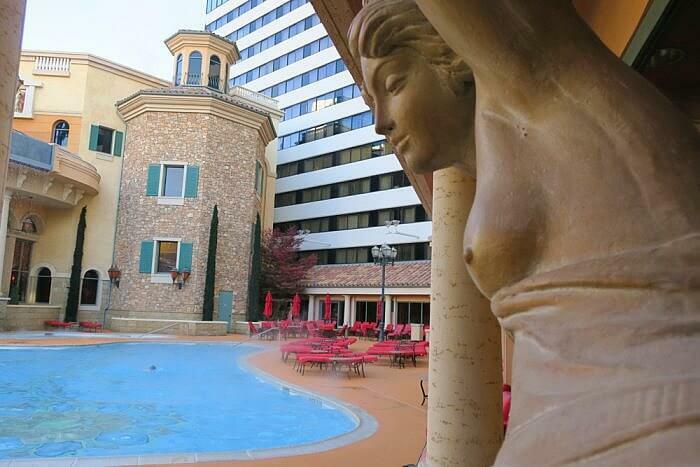 Take your pick on heated pool or outdoor pool. The finest spa experience – you have a tri-level effect of pampering. 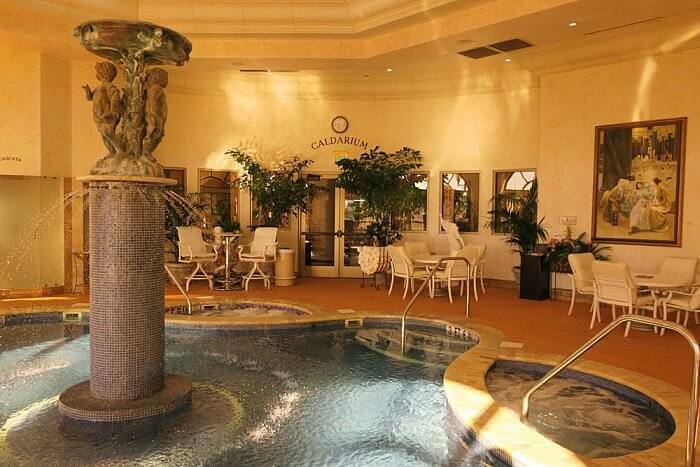 Relax in northern Nevada’s only Caldarium that includes an indoor pool, sun deck and Secret Garden. The Peppermill’s Game Lab Arcade offers Reno’s largest collection of retro arcade games. Its round the clock gaming casino at the city’s best gambling spot. Did we mention 15 bars? Each bar has its own theme. The Fireside Lounge is legendary. For a complete throwback, the Fireside Lounge is the property’s original bar around for over four decades. Patrons love to hang at the storied booths. For the best local live music in the city, head to the Terrace Lounge. On any given night experience a medley of tunes from jazz to the latest hipster swing trend. Watch locals get their jitterbug and two-step on to the sounds of rowdy drums and a smokin’ sax. 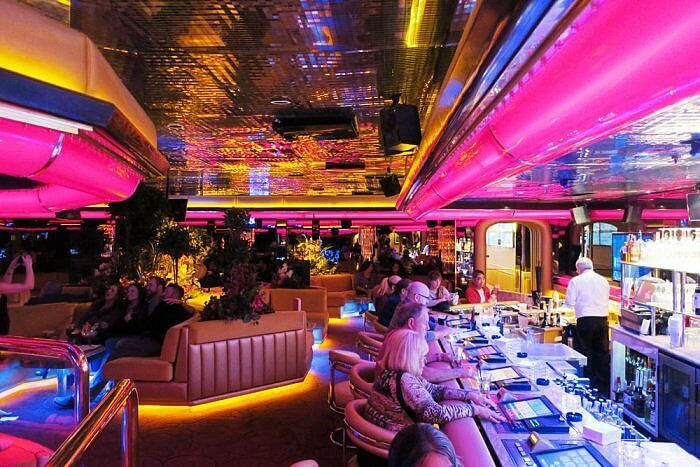 Amid the foot stomping good time see a vast selection of rare spirits (over 285 liquor labels) and a drop-dead visually stunning hanging chandelier. More nightlife is to be had at the newly redesigned EDGE Nightclub, a fun boudoir of edgy 1920s chic with state of the art technology. The Spa Toscana – only place I have seen with its own built-in custom made bathing suit spinner. The Spa and Salon Toscana are one of the largest in the city. Over 33,000 sq.ft of relaxation bliss. The Spa Toscana includes a wellness ritual that traces its roots to the 5,000 year old natural healing methods of Ayurveda in ancient India. The lower pool is heated year-round. You can travel the world without ever having to leave the resort due to a unique video art installation. Titled Windows of the World, a $35-million project over 14 years, Peppermill hired a photographer to capture scenes from over 100 countries. Watch them on any of the 4,180 high-def plasma screens scattered across the property. 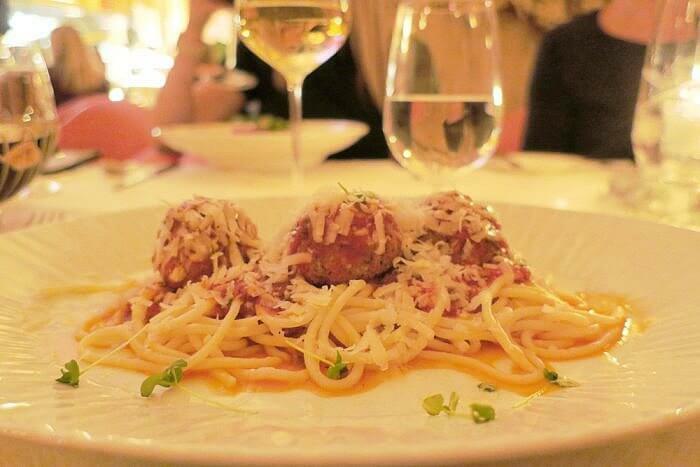 Guests have a wide variety of dining experiences. Choose from 10 restaurants. 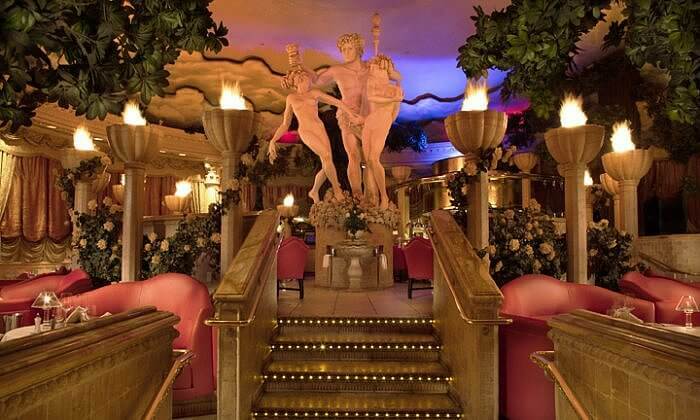 My favorite, the Romanza Ristorante Italiano was literally like I walked onto a Hollywood movie set from Cecil B. DeMille days, fun kitsch with a rotating display of over-sized Davids gave this private dining area, a fabulous place to enjoy the night amid plaster cherubs. A steady stream of servers ushering creative Caesar Salad renditions to the dining patrons made the experience a great spectacle to watch. For fresh-obsessed foodies, the restaurants here started to source locally produced veg like kale, romaine and heirloom tomatoes since 2014. Meanwhile, the steak and potatoes crowd indulge at Bimini Steakhouse, home to over 1000 wine bottles from around the world. 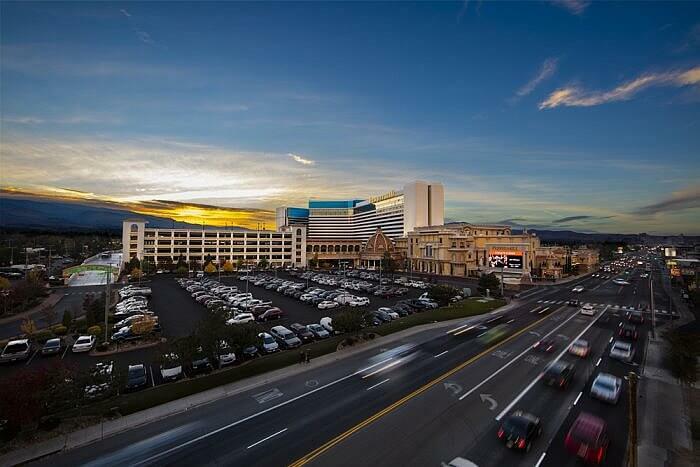 Spice it up with a night or two at the iconic Peppermill Resort Spa Casino. You can make your booking at the Peppermill Resort Spa Casino website, the Preferred Hotels website or an OTA such as Hotels.com. Rates in the hotel vary according to season and room type but look for starting room rates at $80. Ilona Kauremszky was a guest of Peppermill Resort Spa Casino and Travel Nevada which did not approve this editorial.